← An Apple a day …. The Cards app from Apple allows you to custom design cards with text and photos from your phone and they’ll mail it (actually post it not email), in a chic addressed envelope, to ANYWHERE in the world! They have a bunch of pre-designed templates you can choose from and you design the inside and outside of the card, adding in your own photos and messages. This entire process could take as little as a minute to design and address your card. It really couldn’t get easier. I love the utility – I love the price – I love how easy this is to use. The app itself is free to download, and once you design your card it costs $2.99 to post anywhere in the U.S. and $4.99 internationally. This app by GreatCall gives you access to a live registered nurse 24/7, and a medical encyclopedia, and a symptom checker! Basically its great for hypochondriacs like myself. The app’s key feature is the interactive symptom checker tool that helps to identify symptoms, possible causes and when to seek medical help and/ or if you can treat yourself and how. 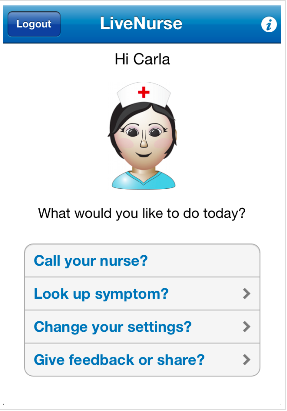 If you need additional help, you can tap and get direct access to a registered nurse. Genius! They’re giving away a free 30 day trial right now and then the price is $3.99 per month. I haven’t yet gotten past my free trial so don’t know if they have any hidden costs, but I’m liking this idea so far. PS: According to the app, I have a possible pollen allergy. Best App ever! Basically it gives you access to hundreds of FREE movies and TV shows on your iPhone, iPad, iPod touch… whatever. You don’t need to sign up, or pay a dime. It works on 3G and Wifi and yes, these are FULL length movies and TV shows and they keep adding new content – they claim to add 20 new movies and TV shows monthly!! Crackle is a division of Sony Entertainment, so this isn’t shady illegal content – it’s all legit, great quality stuff. I love putting on an episode of Seinfeld as I wait my turn at the doctor’s office or in line to get my chipotle – time goes by so much quicker! Its a great entertainment app – my phone wouldn’t be the same without it. Price: Free. No additional costs for content. I can’t seem to find any shows or movies I like on crackle. Help please? -channel specific apps like ABC player, CW etc allow you to stream specific shows to your iPad or iPhone for free. -show time and HBO subscribers have access to a startling no of movies on their respective HBO GO and Showtime anytime apps as well. An ipad the trick here is to ignore the main website which won’t work because it needs flash and go to the iPhone.catchup.com website get a login and watch any of the freeview channels on your iPad without a fuss. ‘Jobs’ Movie is coming out soon! SOCCKET: Can a ball really generate electricity? Apple TV or Roku ?